When new volunteers come to volunteer in Kids Ministry it’s important to make them feel welcome and give them details about what they need to do. Crossroads Church has a sign posted in their kids rooms that reminds the current volunteers what they should do when a new volunteer arrives in the room to serve. New volunteers will feel welcomed and equipped to do their role if someone takes the time to walk through some basic things with them. 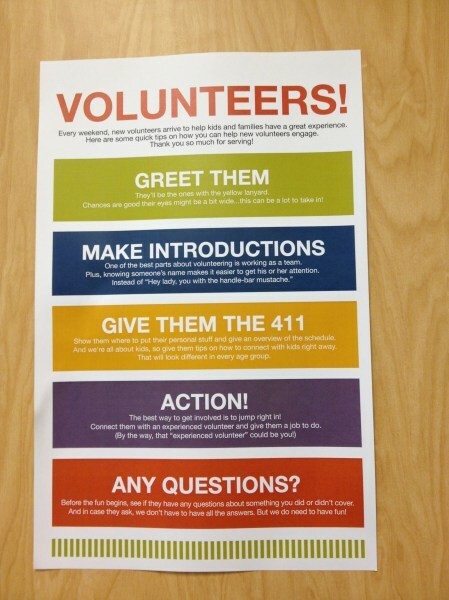 This sign was displayed on the cupboard in the room so that all volunteers could see it and be reminded of what to do when a new volunteer joined their team. Keeping this information vision helps everyone to know what to do. Greet them – Saying hello when they arrive lets them know that they are valued and you are happy to have them there! Make Introductions – Help them get connected by introducing them to the rest of the team. Give them the 411 – Let them know what is going to happen that day, and what you need them to do. Action! – Connect them with an experienced volunteer and help them jump right in. Any Questions? – Ask them if they have any questions. It’s a great idea to assign one person to partner with the new volunteer to help show them what they need to do. It is also a good idea to ask everyone in the room to introduce themselves. Volunteers can make the new volunteer feel welcome by greeting them, asking them how they are doing, or looking to see if they need help from time to time. To read more information on a gift to give new volunteers, visit this blog post. To see an example of our volunteer handbook, visit this blog post.